A complete range of treated Glass Cords for the reinforcement of rubber, silicone and thermoplastic extruded profiles in automotive and building applications; rubber hoses and cable coverings. According to industry estimates, around 25 percent of all EPDM produced each year is for profiled weatherstrips used in the automotive industry. This amounts to some 250,000 tonnes annually. Such profiles are commonly used as seals around car openings; boots, windscreens, windows and doors. If the designers have done a good job, the profile should be forgotten as soon as it is fitted, keeping the weather out, reducing transmitted noise and preventing draughts and vibration from spoiling the comfort of the passenger cabin. These profiles are produced in long lengths in continuous extrusion processes. One of the critical factors in keeping costs down is to run the extrusion line as fast as possible and to minimise waste. Each production line might be up to 50m long and include a number of different processes. The rubber has to be extruded, often co-extruded with a metal spring to improve the sealing force. Next is vulcanisation, surface treatment, adhesive brushing, flocking and flock adhesive curing and so forth. Scrap is a major issue in the industry. Partly the issue is about appearance. All car makers are concerned that their products appear perfect to their customers, and these profiles are often very visible, so the surface finish has to be near-perfect. A second issue is cost. Given that the profile goes through a number of processes, any problems need to be identified early, so that material which will be scrapped is not further processed, wasting time and money. Adding near inextensible glass cord to the profile can improve the in-service performance of the finished product and reduce scrap rates, at minimal cost. Each glass cord is prepared for use in rubber. Individual filaments are pre-coated with a resorcinolformaldehyde latex (RFL) primer, and the coated fibres assembled into cords, before being cured. Each fibre is typically about 10um in diameter, and each bundle is make up of around 1600 such fibres. This process prepares each individual fibre, and makes for better rubber adhesion than alternatives where finished Glass Cords are dipped in the primer. A specific primer preparation can be selected for each application, with latices tuned for compatibility with EPDM, SBR, CR and other compounds, in addition to very high performance cords for the demanding extremes of synchronous timing belts. Once the cord is assembled, a final twisting operation draws the bundle into a cord structure. A typical Glass Cord for profiles would have finished diameter of just under 0.5mm. This small strand has a breaking capacity of 25kg and a linear density of 400 tex (g/km). Prepared glass cord adds about €0.003 to €0.004 per metre to the cost of the profile and this extra cost is easily offset by a reduction in scrap. NGF can supply up to 10kg of cord on a single bobbin; enough to produce 23,000m between bobbin changes with light cords. The cord passes through the cross-head extruder so that it is properly aligned with the die as the EPDM is forced out of the extruder. Hot, uncured EPDM is very soft, and can stretch or sag if the line is not set up very accurately. However, since the glass cord is all but inextensible, it can be used to take the tension without distorting the geometry of the rubber profile. 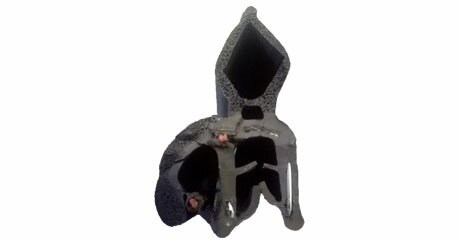 As the temperature rises during vulcanisation and then cools again, ordinary profiles can become distorted, or expand. With the glass fibre, however, the profile cannot change significantly in length. A final benefit in the process is that when the profile is cut to length, the Glass Cord prevents it from stretching under the tension of the haul-off. Thus the cut lengths will remain the same length, with no shrinkage during storage. Almost all profiles are stretched during fitting on the vehicle. Most of these profiles are matched to the dimensions of the door, during manufacturing and preparation, so stretching one part of the profile may lead to distortion and awkwardness during fitting. In the worst case, the profile might be stretched to the point of permanent distortion. This can cause the profile to be scrapped, or once fitted, to recover slowly over time so that the initial weatherproof, windproof, soundproof system is compromised. However, profiles which incorporate a glass cord cannot be distorted significantly during installation, no matter how much the fitter manipulates the seal. This last benefit is of particular interest for building profile seals, which are often supplied as continuous lengths to be cut to size on site. Without Glass Cord reinforcement, there is a considerable risk that the installation tension will extend the EPDM. With time, slow elastic recovery will result in shrinkage of the profile lengths, leading to the creation of gaps at the points where two mitred cut ends are butted together. This will not be a weatherproof joint. Profiles with Glass Cords, given fairly rough handling, have been shown to overcome these tendencies, and provide effective sealing profiles.